TODAY Tim Aker has notified the Chief Executive of his decision to resign as Councillor for Aveley & Uplands. Tim Aker said: “It is with great sadness that I resign from my role as ward councillor for Aveley and Uplands. As is well known I was born and raised in Aveley and have huge affection for the place. To be elected twice as Councillor for Aveley and Uplands was a great honour. “I have taken this decision for two reasons. 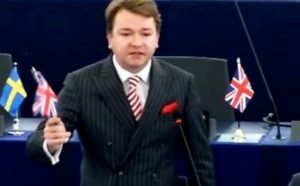 Firstly, the crisis created by the shambolic handling of Brexit has forced me to spend almost all of my time at the European Parliament. Whilst I have always been able to assist residents via email, phone and house visits, important voting meetings and Brexit debates during the week in Brussels and Strasbourg, have prevented me from being able to fulfil all of the other duties that the role of Councillor demands. Secondly, I moved out of the borough last week and I do not believe that it is right for me to continue as a Councillor at Thurrock Council. A Notice of Vacancy has been published for the Aveley and Uplands Ward following the resignation of sitting councillor Tim Aker. A by election to fill the vacancy will be held within 35 days of the required notice being given to the Returning Officer in writing by two electors from the borough of Thurrock. One Response to "MEP Tim Aker resigns as councillor for Aveley and Uplands"
I give you credit Tim. Unlike Nigel Mirage or Bonkers Boris who did a disappearing act not knowing how or even have a plan on how to deliver you did stand by and try to deliver Brexit. I know we both agree May as cocked this one right up. But you did try. probably best getting out now. Before May tries to blame you instead of taking personal responsibility for her own choices. But that seems to be the way with the Conservatives Blame UKIP, Labour, LibDems. Green,SNP. Thurrock independents. We Conservatives are just the ones running the show and in power so its not our fault is it. Do consider standing for elections in the future it is good to have a broad choice of people to choose from. Rather than the traditional Establishment.